This week sees the return of Top League action as the top four teams from each conference (Red and White) battle it out between Dec 1st and Dec 15th to determine the 2018 Japan Top League Champion. 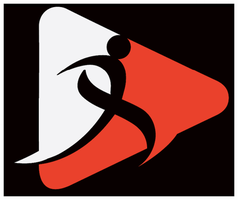 Teams ranked 5th to 8th in their respective conferences will also enter a playoff system to decide which of those sides will have to face the best four teams of the Top Challenge League (Division two) in a promotion / relegation playoff. Jubilo is up against the unpredictable Shining Arcs. Yamaha is unbeaten at its Shizuoka fortress this season, dispatching the Red Sparks, Heat, Brave Lupus and Black Rams while averaging 36 points on attack and conceding just 16 per game. Yamaha’s only loss came at the hands of Panasonic way back in round four, when the Shizuoka side was blanked 15-0. Since then Jubilo has been destroying opponents both home and away. The Shining Arcs meanwhile come into this playoff match with a less than stellar record. Four defeats out of seven, but the second best attack in the Red Conference secured the team enough valuable bonus points to claim 4th position. NTT coach Rob Penney has thrown a curveball by selecting Amanaki Mafi to play despite court proceedings in his assault case still going on. The Japanese international - suspended all season - has been recalled with the hope that he will shore up the defense as well as provide the Shining Arcs with more punch in attack. The Shining Arcs have yet to beat one of the top three teams this season. They’ve come close, losing by seven points or less each time but an inability to play the full 80 minutes has been NTT’s downfall. Jubilo on the other hand has been ruthless until the final whistle and with home advantage again, Yamaha should take this one by seven points or less. This game is a mouth-watering match-up between two teams that were unbeaten through rounds three to seven. Last year’s defending champion face a resilient Spears side that boasts the third best defense in the competition. That defense helped Kubota close out hard-fought matches against Canon, Honda, Ricoh and Toshiba. Only Panasonic 15-11, and Yamaha 20-18, managed to scrap past Kubota in the opening two rounds. Suntory will have to be at its attacking best but history between these two sides suggests that Sungoliath will dominate. The home side enjoyed six victories in the conference stages, falling just once - to the rampant Kobelco Steelers 20-36 in week three. Kubota’s defense may initially prove a tough nut to crack for Suntory. However, a superior attacking skillset plus a wealth of pressure-playoff experience should see Sungoliath through by seven points or less. The Steelers are the only remaining undefeated team in the 2018 Top League. Having produced a mammoth 353 points from six wins and one draw makes the Kobe-based team a real contender for the final. First things first however; the Black Rams need to be taken care of. The last two weeks of conference play saw Ricoh produce some outstanding rugby. The team from Tokyo put Panasonic Wild Knights to the sword 26-17 and pushed top seed Jubilo all the way in a thrilling 11 try spectacle, before eventually succumbing 40-36. The Black Rams are definitely dangerous with ball in hand and will need to be well contained by Kobelco if Steelers are to win. If the weather is fine, expect an entertaining try-fest as both teams will try to play an expansive game. The Steelers average 52 points at home and should have too many attacking options for the visitors. Kobelco’s Dan Carter has contributed 59 points with the boot at an 88% success rate. With the masterful fly-half running the show, the home side should overpower the Black Rams by 10 or more points. Panasonic was untouchable heading into the sixth round, but it went horribly wrong for last year’s finalists at home against a resurgent Ricoh side that took its chances while the Wild Knights were down to 14 men for 20 minutes. That was just one small blemish though in a year that otherwise saw a commanding rock-solid defense paired with an enterprising attack. In fact, Panasonic sports the tightest defense of the competition, giving up just 96 points over seven rounds at an average of less than two converted tries per game. That total is miserly considering some of the lop-sided scores that have been witnessed this season. Toyota Verblitz has a huge job on its hands in breaking down the Wild Knights’ resistive wall but has a few tricks up its sleeves in offense. Namely in the form of center Henry Jaime who has scored seven tries in as many matches, fly-half Lionel Cronje who kicked Verblitz to a 26-all draw against the mighty Kobelco Steelers and versatile loose forward and captain Kazuki Himeno. This brutal battle will be won or lost upfront with both forward packs trying to exert their dominance at the breakdown. Panasonic’s defense has been its main weapon and it will surely be tested by Toyota. With home advantage, the Wild Knights’ defensive line should hold and edge the visitors by five points or less. 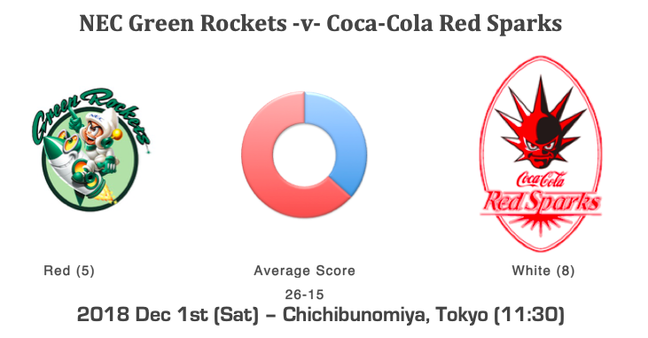 So close so far for the NEC Green Rockets as they met an on-fire Kobe team that quashed any chances of making the top four. This season has been a bit of a mixed bag for the Green Rockets; narrowly losing 8-9 to the Shuttles in round one then beating the in-form Shining Arcs 34-31 in round five. Defense has been an issue as well as trying to play catch-up against the stronger sides. This week the NEC team is in luck however as its opposition conceded the most points (315) in the 2018 season. Stuck on zero points, the Coca-Cola Red Sparks have performed the opposite to what their name suggests. Every match the Fukuoka-based side has played in has sputtered and fizzled with any chance of victory going up in smoke before the half-time hooter has even sounded. NEC ought to have no problem extinguishing the Red Sparks and should comfortably beat the Coca-Cola team by 10 points or more. The Heat must be brimming with confidence after smashing Brave Lupus 45-26 in the final round of pool games. That result catapulted Honda over Toshiba into 5th position in the table and with it some respectability for the newly promoted side. That’s more than can be said for the Blues however. They were on the receiving end of a half dozen hidings cementing them dead last in the Red Conference. It has truly been a woeful year for a Munakata Sanix side whose leaky defense has let in 40 points per game. There is only one way this upcoming match can go. Even though Honda’s defense has also been shaky, the Heat’s ability to cross the white line and score 30 points a game compared to the Blues’ paltry 11 has the home side as favorites. The Honda Heat should be able to clean up and win by 10 or more points. For the 2018 Top League season, Toshiba finds itself out of the top eight in just the second time in its illustrious-playing history. Recording just two wins from its seven matches, the five-time Japan Top League Champion has, to put it mildly, been going through a bit of a rough patch. The highest ranking Brave Lupus can achieve this year is 9th position which is exactly how the side finished up in the 2016-17 season. Are we witnessing the beginning of a decline in what was once a powerhouse of rugby talent? Another team struggling to find form has been the Hino Red Dolphins. After registering their first win over the bottom-feeding Blues in round one, the Top League newbies have lost six on the trot including a particularly brutal 74-point pasting by the Steelers. A step-up in power and pace of Division one has clearly been overwhelming for the Red Dolphins who are likely to be one of the teams battling for their Top League survival. With loose forwards Michael Leitch and Yoshitaka Tokunaga back in the mix from international duty, Brave Lupus will be heading into this match with a lot more confidence. Leitch has been in colossal form recently scoring a brilliant try against England followed up by a brace to seal victory over a fired-up Russia. If selected to play on Sunday, expect the Brave Blossoms’ captain to inspire his teammates to a dominating display on the scoreboard. Toshiba should beat the suffering Red Dragons by 15 points or more. These two sides are fairly even in terms of their performance records in the pool games. The Shuttles won three and lost four however all of those defeats were against the top four finishers in the Red Conference. Whereas in the White Conference, the Eagles racked up two victories and a draw but like the Shuttles, they also lost to the best four leading teams. The telling difference being the total number of points conceded in each of their losses. The Toyota Industries team yielded 49 points per defeat while Canon only gave up 28. On attack however, paints a different picture. When contesting for a lost cause, the Shuttles averaged 27 to the Eagles’ 11 points. All of this may suggest that a fourth Shuttles’ victory is just around the corner if the home side can first overcome its defensive frailties. The Toyota Industries Shuttles are due for a win but will need to put on a strong defensive showing to give the team any chance of beating down an Eagles side eager to disrupt. The home side is more than capable of unlocking the top defensive lines as shown in the group games but can the Shuttles’ own defense hold? Let’s give the home fans something to cheer about. The Shuttles should scrape home by seven points or less.